This great property has mains water and electricity connected. 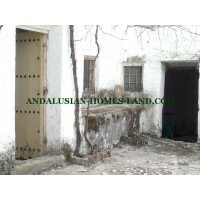 It is perfect to build a beautiful typical Andalusian house. It has 3 bedrooms, bathroom, lounge with fireplace, spacious kitchen, pato, terrace, garden. Peaceful área. Internet available. This magnificent 35,000-square-meter farmhouse with more than 30 years of age needs to be refurbished but it could be converted into a large letting house or a B & B. It has a well and a water tank. It hasn’t electricity for which solar panels are the ideal solution.